On September 23 2014, Palestinian solidarity activists took part in the International Day of Action on College Campuses, calling for students and faculty around the world to pressure their academic institutions to support justice, human rights, and freedom for the Palestinian people. The call was spearheaded by Hatem Bazian, a professor at the University of California, Berkeley. A large rally was held at this school, with over 300 attendees. The rally concluded with a die-in. Later that evening, Bazian joined several other California professors for a teach-in. Many university Students for Justice in Palestine (SJP) chapters tabled and held demonstrations on their campuses to raise awareness and to educate fellow students about Israel’s brutal occupation and oppression of Palestinians. Stanford SJP activists chalked the center of their campus with the names and ages of Palestinian children killed in Gaza in Operation Protective Edge. Similar demonstrations and events were held around the country. Student organizing was by no means unencumbered, nonetheless. The day of action entered the spotlight in mid September when a leaked email showed that the Anti-Defamation League (ADL) was pressuring universities to crackdown on Palestinian solidarity activists. The ADL demonized the organization American Muslims for Palestine in particular, who helped organize the International Day of Action, falsely accusing it of attacking “Jewish communal organizations.” The chancellor of University of California, Davis was later publicly criticized for circulating the dishonest email with administrators. Perhaps the highlight of student actions took place at Oberlin College, a small liberal arts college in Oberlin, Ohio. There, the organization Oberlin Students for a Free Palestine held a “2,133 black flags, 2,133 Palestinians dead, do not be silent” action, in which activists created an enormous installation, planting a small black flag for every Palestinian killed in Israel’s most recent massacre in Gaza, Operation Protective Edge. These black flags honor the 2,133 Palestinians murdered by the Israeli Defense Forces over the 51 days of Operation Protective Edge. Israel receives more military assistance from the United States than any other country in the world at an annual rate of $3.1 billion dollars. Our tax dollars, and likely our tuition, funded this genocide. This is not a vigil. This is a call to action. It is a recognition of our complicity in these acts of violence. It is a refusal to be silent. The activists asked onlookers to sign their online petition, demanding an administrative response to an Oberlin student divestment resolution. The flags remained up until the morning of the 27th. I contacted Oberlin SFP to inquire how the college and community responded to their action. They were pleased with how well the action went. They reported seeing a lot of support from the student body. On the evening of the 24th, approximately 60 people, representing a variety of student and local organizations, gathered to read statements of solidarity with Palestine. Many of these connected the struggle for justice in Palestine to those other oppressed peoples around the world, particularly those in Ferguson, MI—a parallel numerous Palestinian organizations have made since the murder of Michael Brown on 9 August 2014. According to SFP members, the Zionist presence at Oberlin is much more of a liberal variety, as is increasingly common for today’s generation. A student told me that many Jewish students at Oberlin are in fact uncomfortable with more hardline Zionist organizations, namely Hillel, and “feel unwelcome in their spaces.” The Oberlin Hillel Facebook page has not been active in two years. The Oberlin administration has yet to respond to the action or to the calls for accountability, and SFP members admitted that do not find it likely that it will. Oberlin Students for a Free Palestine did not encounter any trouble from their administration, as they registered the installation with Oberlin’s security and facilities departments beforehand. Other university administrations, however, have not been so kind. In one of the more publicized recent controversies, in March 2014, Northeastern University banned its SJP branch, in what many characterized as a draconian act of censorship. Student activists had engaged in a harmless mock eviction action, distributing what were clearly fake notices in order to educate students about just one of the many fears Palestinians face on a daily basis—the very real possibility of an Israeli government official arriving to tell you that the home your family has lived in for generations is, without any kind of trial or due process, now going to be demolished. Northeastern SJP member Max Geller stated that his “school was accusing us of an act of criminality for simply [an] act of leafleting,” and that “NYPD-style tactics were used against students” for handing out pieces of paper. The administration asked the Northeastern University Police Department to conduct an investigation. The authorities immediately went after any Arab and Muslim students involved. Two students were threatened with expulsion—both of whom happened to be women of color. Neither was an officer in the organization, just rank-and-file members. Crackdowns of this kind are by no means limited to the US. In Israel itself, students are suffering huge consequences for criticizing their government. In the wake of Operation Protective Edge, Israeli scholar Amir Hetsroni wrote in Haaretz of “the undeniable attempts by academic management to prevent students and faculty from speaking their minds and punishing those who protest against the war.” He details extreme policies of Israeli universities, enumerating incidents in which students were were punished, fined, and even arrested simply for speaking their mind. Before the massacre in Gaza, Hetsroni explains, he opposed the academic boycott of Israel. But when he saw the role Israeli universities played in stifling opposition, his position quickly shifted. “A college that prohibits students from taking part in political protest is not an academic institute. A university that vetoes its faculty’s right to publish non-Zionist (not to say anti-Zionist) scholarship is not a university. In such cases an academic boycott might be an acceptable response,” he confessed. The International Day of Action for Palestine was organized by a scholar, to take place on college campuses. Many of the leading figures of the Palestine solidarity movement, and the organizers of the BDS movement, are scholars. Academe is, in many ways, today a locus of the struggle against Israeli apartheid—just as it was for the struggle against apartheid in South Africa in the quite recent past. Academic institutions are a key part of the ideological and institutional scaffolding of Israel’s regime of occupation, colonialism and apartheid against the Palestinian people. Since its founding, the Israeli academy has cast its lot with the hegemonic political-military establishment in Israel, and notwithstanding the efforts of a handful of principled academics, the Israeli academy is profoundly implicated in supporting and perpetuating Israel’s systematic denial of Palestinian rights. This is the reason institutions are cracking down so harshly on student activism. Much of the ground gained in the BDS movement has been in Academia, led by the PACBI. Israel’s own desperate attempts to manipulate public opinion demonstrate how much it fears the power of the BDS movement to end its decades-long process of colonization. Israel pays students (and handsomely, at that) to spread government propaganda online. In recent years, as the momentum and strength of the BDS movement increases, Israel has even gone so far as to pressure foreign governments to crush Palestinian solidarity activism. Using this summer’s massive call-up of IDF reserves as a model, JAFI began to conscript its “reservists” and, with emergency funding from Jewish Federations of North America, pressed 20 former Israel Fellows back into its ranks. The reservists themselves are happy to serve and have taken off between two weeks and a month from their “civilian lives” to return to campuses in North America. In spite of the ferocity of the clampdown on dissent, and in spite of the prodigious political capital of the Zionist establishment, the truth of Israel’s crimes in Palestine has been increasingly difficult for the average American to ignore. The victory of Northeastern SJP, the calls for divestment by student activists at schools like Oberlin College, and the immense push-back against the attack on Salaita’s academic freedom all show that the Palestinian solidarity movement is really taking off in the US. To call the US Academy the “battleground” for Palestinian liberation is of course hyperbolic—and even downright insulting, considering the actual live battleground the Palestinian people live in, and their valiant and multifarious forms of resistance against oppression. At the end of the day, the struggle in the US is only one of solidarity with the Palestinians as they themselves fight to liberate themselves. Yet the fact that Americans, the citizens of the superpower whose economic and political support has allowed Israel to continue its egregious crimes with complete impunity for so many years, are now questioning their country’s relationship with Israel is an exceedingly important step in this long haul. In April 2013, the Association for Asian American Studies voted to boycott Israeli academic institutions. Months later, in December, the American Studies Association and the Native American and Indigenous Studies Association did as well. Similar boycotts of Israeli academic institutions have been declared by prominent organizations in the UK, Australia, South Africa, and many more countries around the world. I have no problem collaborating with Israeli scholars and artists as long as we do not participate in any Israeli institution or have Israeli state monies support our collaborative work. The reason, of course, is that the academic and cultural boycott seeks to put pressure on all those cultural institutions that have failed to oppose the occupation and struggle for equal rights and the rights of the dispossessed, all those cultural institutions that think it is not their place to criticize their government for these practices, all of them that understand themselves to be above or beyond this intractable political condition. In this sense, they do contribute to an unacceptable status quo. Today, distinguished Israeli scholars such as Ilan Pappé, Shlomo Sand, Neve Gordon, Oren Yiftachel, Anat Biletzki, and more have supported academic and cultural boycotts of their own state. Their calls for justice, in fact, have been some of the most vociferous. People from all walks of life, around the world, are calling for human rights and dignity for the Palestinians, and the university has served as the rallying point for these calls. The “war” for hearts and minds, as Sharansky fancies it, is indeed being waged on the “battleground” of the US university campus. But, despite the enormous and formidable forces rising against them, those seeking justice and freedom for the Palestinian people are winning. The arc of the Moral Universe is indeed slowly, and painfully, but surely, bending toward Justice. Anybody keeping a score-card with the names of universities which have interfered with pro-Palestine activities or speech (and descriptions of all that happened, blow-back, etc.)? And those (if any) which have helped (or not hindered) pro-Palestine activities and/or speech? I bet the first list is getting quite long about now. Don’t know if this answers your question, but: in 2008 there was a budding and very active group at the College of William and Mary. — a sort of mill for future federal employees and and officials (I.e. Bill Gates). They even had Alison Weir speak. But then they disappeared or were snuffed out? The suppression of facts and discussion in America, a country with freedom of speech in its bedrock law, its Constitution, and especially in America’s colleges and universities, is utterly reprehensible and indefensible. Any American citizen who participates in such suppression should be deeply ashamed. It’s easy to understand why the defense of Israeli policies and actions require such suppression. Israel’s “special relationship” with the U.S. is based almost entirely on a fictitious story. This deception has been made possible by massive amounts of money. It is entirely fitting that universities and colleges should lead the resistance against this massive dishonesty. Ironically, Jews have been victims of this deception right along with non-Jews. I am so depressed that Richard Horton is apologising for a perfectly reasonable letter about the Gaza assault. I had thought better of the Lancet. I was becoming increasingly agitated by the article in the link when I realized the paper it was published in – the Lancet’s editor may see fit to apologize about only the two individuals involved but people like Derek Summerfeld who has a long history working with torture survivors and was an ardent critic of apartheid South Africa, as well as Mads Gilbert who has first hand knowledge of the conditions in Gaza; they cannot be dismissed that lightly. “Hassan, who has worked at the mental health center since 1991, spoke a lot in our conversation about the meaning of psychological treatment during periods of unrelenting and continuing trauma. “I came to the conclusion that such treatment is not ethical,” he said. “For 23 years, I have been trying to help children living in trauma, but there is no guarantee that they will not be affected again. It’s as if I am just preparing them to deal with something worse. You cannot provide true psychological treatment when the patients have no protection, no guarantee that it won’t happen again and soon, when what causes trauma never ends,” he said. Zionism is a really awful ideology. Jews deserve better. [EXCERPTS] At least two of the four law enforcement agencies that were deployed in Ferguson up until Thursday evening — the St. Louis County Police Department and the St. Louis Police Department — received training from Israeli security forces in recent years. . .
. . . 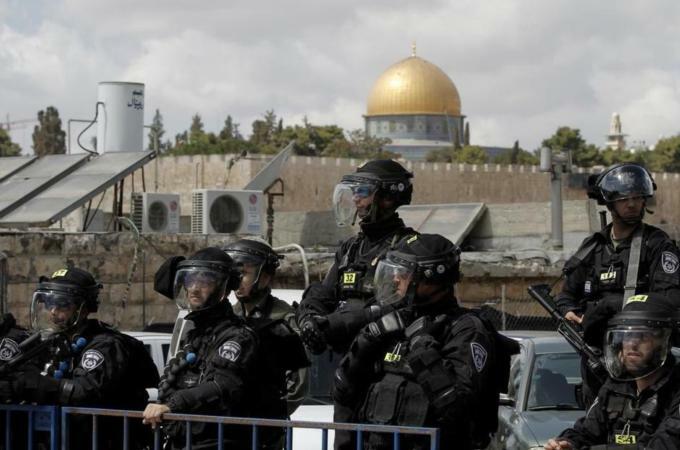 While there is a wealth of scholarship on police militarization in the US, there has been little to no examination of the ways Israel’s security apparatus facilitates it. As a result, Ferguson no longer looks like occupied territory, though the underlying issue, Michael Brown’s murder, has yet to be addressed. . .
Atlanta Police Department Major Rodney Bryant completed a two-week public safety program and exchange focused on new public safety techniques and technologies. Organized by the Georgia International Law Enforcement Exchange (GILEE), Major Bryant along with 16 other senior Georgia public safety officials learned best practices on counterterrorism measures. Major Rodney Bryant is the commander of Zone 4 and has more than 20 years of law enforcement experience. The Department regularly participates in global public safety exchanges. The Atlanta Police Leadership Institute is a leadership program that prepares all ranks for promotional opportunities. The APLI program includes training on international law enforcement issues where officers learn tactics on preventing acts of terror, responding to suspicious objects and organizing volunteers for emergency response. Additionally, this year the Atlanta Police Department has hosted several international police agencies including the Nicaraguan National Police and Israel National Police Department. . .
MY COMMENT – Here is a very powerful testimonial regarding the impact of Israeli notions of security on policing here in the U.S.
Look familiar (as in Ferguson)? What about the largest Palestinian university by admissions Birzeit University which has instituted apartheid against Jews on its campus? (refer Amira Haas controversy reported in Haaretz). This reveals gross Palestinian hypocrisy. Carrying out boycotts when your own behavior is much worse. In the same way as Rabbi Lewis is being vilified there is total blindness to the widespread hate speech coming from imams that can be found all over YouTube. “What about the largest Palestinian university by admissions Birzeit University which has instituted apartheid against Jews on its campus? (refer Amira Haas controversy reported in Haaretz). You question reveals gross stupidity. Apartheid means that people have to be discriminated or kept segregated or expelled to maintain an existing regime. And if you want to suggest that the “Amira Hass controversy” is much worse that what Israrel does to Palestinians you have certainly lost your marbles. I’ll I can say is what I observe and note in Portland, Oregon. Here both high end private colleges, Reed and Lewis and Clark both have no Palestinian Solidarity groups, they both do have Hillel and Chabad banging drums and urging the “right” students to go on free trips to that bad country. Portland State University is a little different. PSU has lots of Arab, Muslim and even Palestinian students, they also have SUPER (Students United for Palestinian Equal Rights). However, from personal observation I can say that SUPER has been completely subverted by American Jews and even Israeli Jews taking over the committee, to the point that they have been stalled into inaction, no Arab/Muslim/Palestinian students feel very welcome, virtually no public displays about boycotting Israel or supporting Palestine are made, no critique of the wide and deep collaboration between Israel and PSU is ever made and no activists who realize that this is a propaganda war are welcome. Portland is a very sad case where zionist power seems completely ascendent. “Chancellor Phyllis Wise, the top administrator who fired Steven Salaita from the University of Illinois at Urbana-Champaign after complaints from pro-Israel donors, is facing allegations from academic peers of unethical conduct that may stretch back two decades.